Arthroscopic Subacromial Decompression Doesn’t Relieve Pain is finding of a new study , since at 6 months, shoulder pain outcomes were similar among patients who underwent ASD and those who did not. Since its introduction nearly 100 years ago, arthroscopy of the knee has revolutionised the care of patients with meniscal lesions, ruptures of the anterior cruciate ligament, and cartilage damage. Although knee arthroscopy has proved to be an asset that is highly beneficial to many patients. For Shoulder arthroscopy two areas that are possibly indicated are the glenohumeral joint for intra-articular lesions and the subacromial area that is extra-articular. 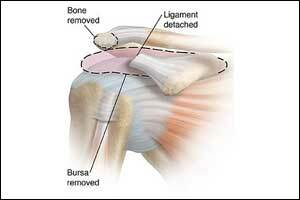 An impingement syndrome of the subacromial area is responsible for up to 70% of all shoulder problems. During shoulder Arthroscopy Arthroscopic subacromial decompression (ASD) is undertaken which comprises of arthroscopic removal of bone spurs and soft tissue to enlarge the subacromial space and reduce impingement on rotator cuff tendons. This is an increasingly common procedure for managing shoulder pain, but its effectiveness is uncertain. Dr.Berend W Schreurs and associates in a random study enrolled 313 patients with subacromial pain of minimum 3 months’ duration and intact rotator cuff tendons and subjected them to ASD, investigational arthroscopy only (a sham procedure), or no treatment. All patients received exercise therapy and at least one steroid injection before randomization. Patients in the ASD and arthroscopy-only groups received advice and one to four physiotherapy treatments after surgery; those in the no-treatment group received only one reassessment visit with a shoulder specialist, at 3 months after randomization. All patients were asked to complete Oxford Shoulder Score (OSS) questionnaire, a 48-point measure of pain and function (higher scores are better), at baseline and at 6 and 12 months after randomization. It was found that after 6 months, mean Oxford Shoulder Score OSS did not differ between the ASD and arthroscopy-only groups (32.7 and 34.2, respectively) and, although both procedure groups attained a statistically significant benefit over the no-treatment group (mean OSS, 29.4), the difference was clinically unimportant. However all the three groups showed significant improvements over baseline in OSS at both 6 and 12 months.There was no difference in the primary outcome between the arthroscopic decompression and arthroscopy only groups (decompression mean 32·7 points [SD 11·6] vs arthroscopy mean 34·2 points [9·2]; mean difference −1·3 points [95% CI −3·9 to 1·3], p=0·3141). This is an intriguing finding, showing that subacromial decompression does not affect the clinical outcome. Arthroscopy is a useful procedure that benefits many patients. However, there are serious concerns that a substantial number of these procedures are done in patients with mostly degenerative diseases, and therefore will not be curative.